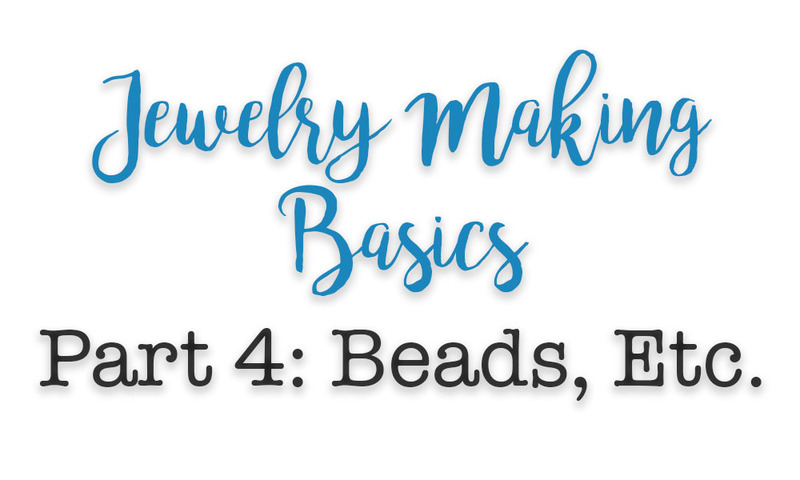 When it comes to learning to make jewelry, it doesn't get more basic than the bead. A bead is defined as "a small piece of glass, stone, or similar material, typically round and perforated for threading with others as a necklace or rosary or for sewing onto fabric." I personally tend to think of them as any material with one or more holes running through it. I've been working my way through this basic jewelry-making series. Before getting into some of the skills needed to make jewelry, I feel that it's important to learn the tools and materials that are key to the skill. In previous posts (with corresponding videos) I've covered Jewelry Tools, Materials, and Findings. As well, there was a guest post from Divya that went over Cords, Ribbons, and Laces. Now, it's time to learn a little about beads. I'm only covering the most basic of the basics as beads come in a vast array of materials, shapes, and sizes. 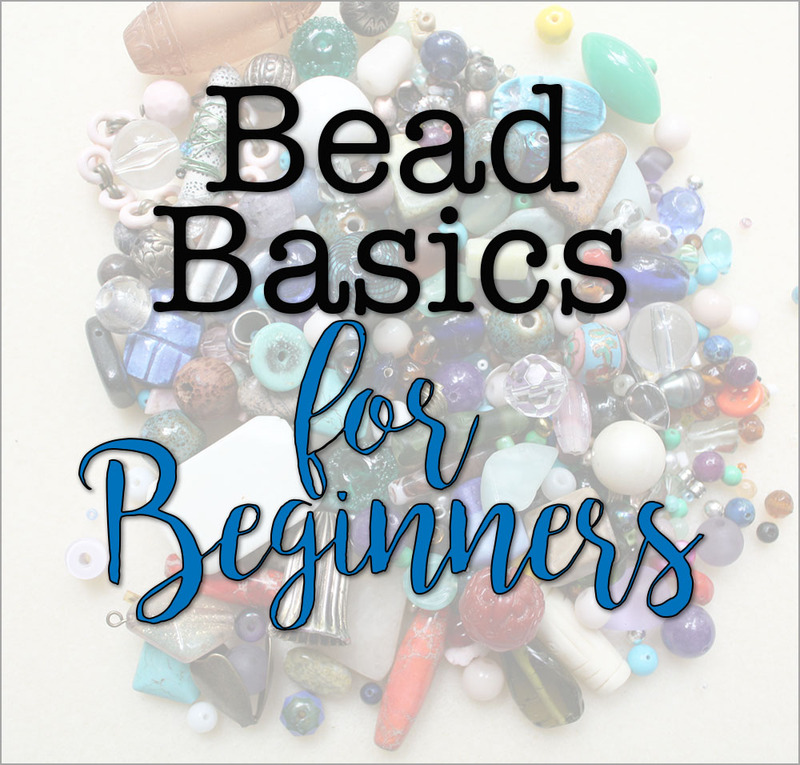 I've also created a video with much of this bead basic information for your convenience. As mentioned, beads, in general, come in a wide variety of materials: glass, stone, clay, resin, plastic, bone, wood, fabric, paper, metal, shell, and just about anything else you can find with or put a hole in it. In addition, the shapes are even more varied than the materials. Below is a review of the most basic of shapes because many times different bead suppliers use different terms for the shapes of their beads. I encourage you to explore different online bead shops and take a look at the shapes to see what appeals to you. Seed Beads: Made of glass and tiny in size, these are most often used by artists who enjoy working on bead weaving, loom work, bead embroidery, and other techniques with much detail. Seed beads come in many shapes and sizes as well as a rainbow of colors. 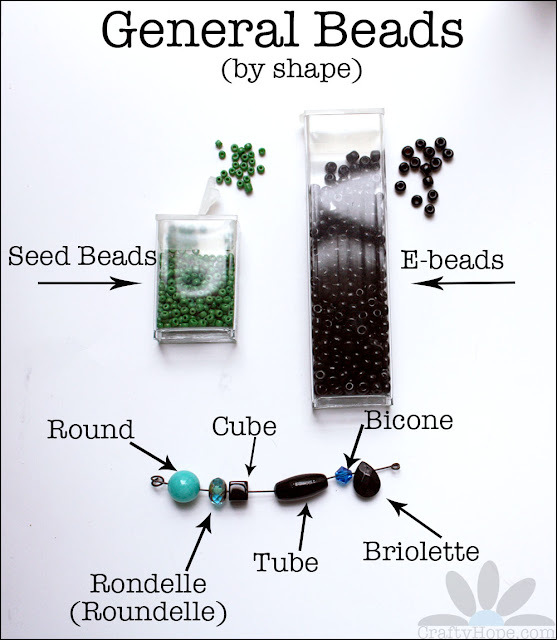 E-beads: Belonging to the seed bead family, but slightly larger in size are e-beads. Like the smaller ones, they can be found in plenty of colors and finishes. Their holes do tend to be slightly larger than seed beads. The beads along the bottom of the above picture are more specific in their shapes. Tube - These might also be called cylinders or any other variety of names depending on the outer shape. Bicone - what it would look like if you joined two cones together by their large circular bottoms (the opposite of an hourglass shape). Briolette - These are often teardrop-shaped with a hole that extends across the thinner portion of the shape so that it hangs from its top. Spacer Beads and Bead Caps tend to be metal elements that are used to accent and separate beads. However, I've seen them made of plastic and glass also. 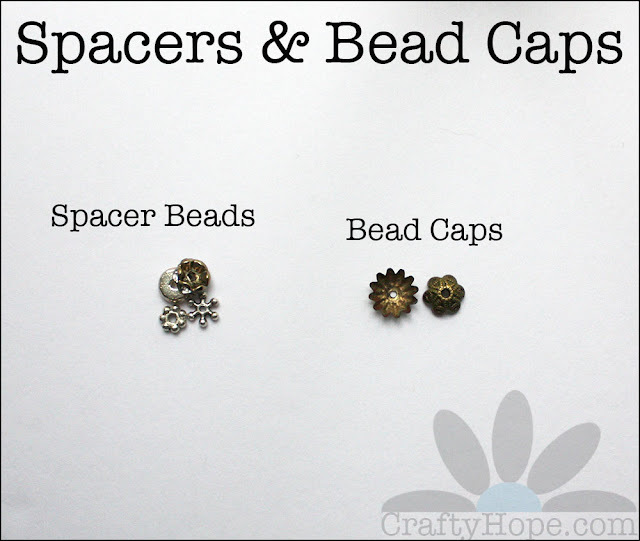 Spacer Beads: Made of a flattened material with a hole through the middle that makes a space between one bead and the next. They can also be called spacers. Bead Caps: These are concave (like a bowl or cup) with a hole in the middle and are intended to cradle one side of a bead. The above elements are not necessarily considered beads but can fall in that general category. Focals: These are the centerpiece of your jewelry design and what draws your eye. They are the focal-piece of your design. They tend to be larger pieces. 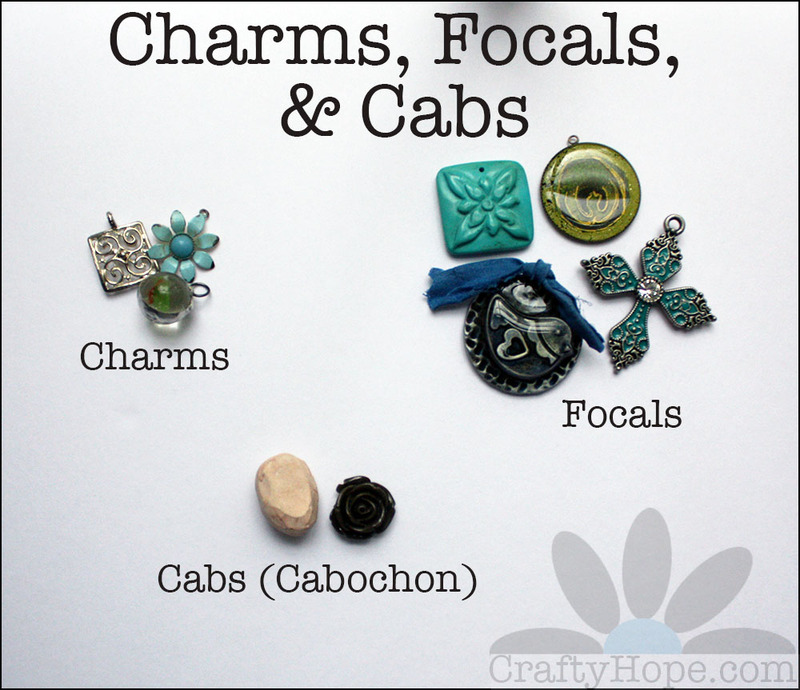 While all the ones pictured above are simply large charms, focals can be any kind of element. Cabochons (Cabs): Materials with a flat-back that can be added to a design via gluing, wire-wrapping, or some other method. The key to recognizing these are that they don't have holes like beads or charms and are flat on at least one side. In looking for a more exact definition, I found that cabs made of gemstones are the ones with smooth/domed top surfaces rather than faceted (cut) faces. However, that's not the way I use the term nor the way I've found other artists to use it. That about sums up some of the most key info I can give you about beads. As always, if you have anything to add, any questions, or any corrections; please don't hesitate to let me know! Have you ever thought about teaching a class with ESILLL? They'd love you! You are so thorough in your descriptions and encouraging! Ha, I didn't know what e-beads were :) Isn't it funny how the word "beads" has acquired a wider meaning? 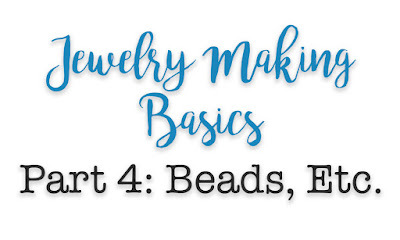 I have mentioned before that I learned almost everything about jewelry making from the internet and I would read each and every post like this one :)- so helpful! Great information for the beginner Hope! It can be overwhelming starting out with so many terms to refer to shapes.